Facelift surgery is a surgery to help people achieve smoother and youthful facial appearance. This surgery makes you look young and will increase your self-confidence. When you age, your skin loses its elasticity and begins to sag. This process can leave your face looking tired and with deep wrinkles, hollow cheeks, jowls and loose skin in the lower face and neck. Facelift surgery could make you look 10 or even 20 years younger. There are several methods of facelift surgery, but the most commonly used method is the superficial musculaoponeratic system (SMAS). This method leaves no scars and healing process is very easy. We highly recommend you to stop smoking as this will influence the healing process of the wound. Smoking after the surgery is not permitted for the same reason as mentioned above. Medication could also affect the healing process. Medication such as aspirin and certain anti-inflammatory drugs prevent the blood from clotting, which is not good for the healing process. Ask your doctor about preoperative instructions with your medication. Any chemical processing of your hair should be performed prior to surgery since you cannot have any of these procedures for a month or more after the surgery. Your facelift will be performed on an outpatient basis, be sure to arrange for someone stay with you for at least the first night following surgery. 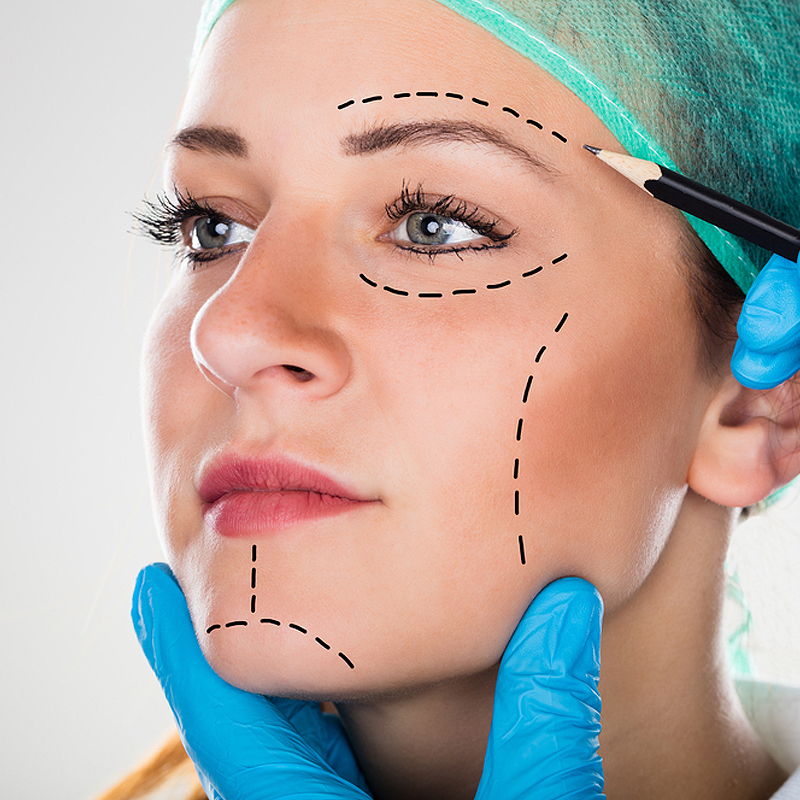 Your facelift surgery may be performed in a hospital facility. Medications are administered for your comfort during the surgical procedure. Normally, local anaesthesia and intravenous sedation are used for patients undergoing facelift surgery. However, general anaesthesia may be desirable in this surgery. For your safety during the operation, we monitor your heart pulse, blood pressure, and the amount of oxygen circulating in your blood. You will be taken to recovery area when your surgery is completed. Your face will be bandaged. Sometimes small tubes will be inserted beneath the skin to drain away the fluid that might otherwise accumulate. After facelift surgery, there is surprisingly very little discomfort experienced. However, any discomfort you may experience will be controlled with pain medication as needed. You can go to your hotel after a few hours or you can stay in the hospital that night if you feel more comfortable. There is no specific time for recovery after facelift surgery it depends on the patient's ability to recovery. Elevation of the head is very helpful in reducing the initial post-operative swelling. The surgeon will suggest you to use a cold compress. You should avoid medications such as aspirin, non-steroidal and anti-inflammatory medications for the first few days after your surgery. Smoking and second-hand smoke should be avoided to prevent delays in the healing process. After bandages are removed, puffiness and discolouration may be more pronounced in some portions of the face than others. No need to worry about temporary asymmetry problems – this is normal. After 24 to 48 hours most of the swellings will disappear, but most bruising resolves within two weeks. You can use makeup after the first week of operation You may experience numbness to the face post-operatively, which usually resolves within several months. Most stitches are removed one week after surgery. Your surgeon will give you information about what to do after surgery. Also give you specific orders that may include caring for the dressings and incisions, directions for your analgesics and other medications, specific concerns to look for, and when to follow up in the office to monitor your healing process. It may take several months for the swelling to fully resolve, and up to 6 months for the incision scars to fully fade. After surgery, you should avoid unprotected sun exposure and cigarette use. Who is a good candidate for the face lifting surgery? corner of your mouth deepened, jowls developed in the cheeks and jaw, you are a good candidate. Will I need to repeat the surgery in future? Is the face lifting surgery painful? some discomfort, tightness and swelling is possible. But none of this could be described as painful. Most of swelling and bruising will disappear within 2 weeks, but recovery may last up to 6 weeks. Some asymmetry can be visible, but do not worry, it will disappear. What should I avoid before the surgery? one month after the surgery you should avoid such chemicals on your hair. your face while you are wearing. You will spend one night in the hospital and six nights in the hotel. In that period you will have consultation with your doctor.